It was exactly a month ago that I gave birth to Gigi. Life is taking on a new normal as my family adjusts to Gigi and she adjusts to the world around her. I feel so grateful to my mom and kids. They’ve been a big help. Right now, most of the family is asleep and I’ve already inhaled a cup of coffee. The writing bug seem to have hit me lately, so here I am typing away instead of staying in bed. Thinking about: // my birthday that’s coming up this Thursday. In the past, it felt like too much to celebrate since one of my sons have a birthday two days before mine. This year I feel differently. I want to celebrate my birthday in a simple way. I also want to reflect on my life so far. Bryan (Still Unfinished) has this wonderful tradition in which he picks books to read and reflect on during his birthday month. I thought about doing that, so I may finally read Barbara Brown Taylor’s An Altar in the World. I bought it years ago when it was first published, read snippets of it, but never finished it. I also feel like I need to reread Twyla Tharp’s The Creative Habit for inspiration. It’s self-help for creative types, but I think almost anyone can benefit from reading it. Now that I’m turning 33, I’ve been thinking about an old passion. When I was younger, I used to write and create art in my art journal every single day. Even with kids, even while homeless, even when life was hard and dark and hopeless, I would write or paint. My journal wasn’t just a journal; it was my commonplace book, my diary, my sketch book, my prayer book. Anything that I wanted to say went into my journal. Some of my old journals. A few years ago, my older kids’ dad stole the journal I was working on at the time and ripped it to shreds with his bare hands. It was a journal thick with paint and words, two hundred pages at least. I was so devastated. And since then, I rarely use a journal. I buy them every now and then, but can never conjure up the enthusiasm I once had. It’s time for me to start creating again. The world has been pretty dim without my constant paper companion. I’m going to fake enthusiasm until the day comes when I don’t have to. This won’t be easy, but of course, not everything is. Good for you! You can do it! A quiet birthday is always nice, too! I used to have a journal too, but it’s been somewhat replaced by my blog, although in the case of my journal, it was more for me than for others…all that to say, I think that’s a great idea for you and you should follow your passion, and not let anyone stop you in that endeavor. I also believe that’s a great idea to “fake enthusiasm until the day comes” when you don’t have to, in some cases. I need to do that with exercise, for example. Oh, I hope you do start to journal again. Those will be treasures one day. Congratulations and congratulations. I’ve been an on again off again journal keeper since middle school, that 40 years now. I’ve done daily entries for long stretches of time. If I don’t think about doing something good, but just about doing something, I usually end up with an interesting journal overall. A month old already! Wow! And happy early birthday to you. I hope both you and your son have wonderful birthdays. Happy birthday, girl! If you love journaling I can’t think of a better gift to give back to yourself. Just start! I bet the love and enthusiasm will come back to you. And yes, you should celebrate yourself! What a beautiful post! You should absolutely celebrate your birthday this year and every year. It’s worth it! As for your journal, your approach seems spot on. Isn’t it what we do for exercise or anything different from our normal routine? If you do it daily, the joy will absolutely be there. I used to journal as a kid but lost the habit at dome point. It’s certainly something I’ve enjoyed and your post reminded me how much I used to enjoy it. I hope you get back to journaling! Yikes, my earlier comment got submitted way too early. You should absolutely celebrate your birthday! I’m sure your kids will love the chance to pamper you. 🙂 And wow, Gigi is a month old already. It’s amazing how fast time does go when there is a baby. I keep worrying that I will miss her tinyness because of how soon she is growing. Happy birthdays, month and years, to each of you! I had a betrayal attached to journalling some years back too, and it took me a very long time to even begin to try to keep a notebook again and regain some of the spirit that was lost, but just beginning to try to move past it is a big step and will lead to amazing things. Don’t wait, you can do it! Oh, friend, I’m sorry your old journal got destroyed that way — what a shame. And I hope you get back to it and find it as satisfying as you used to. 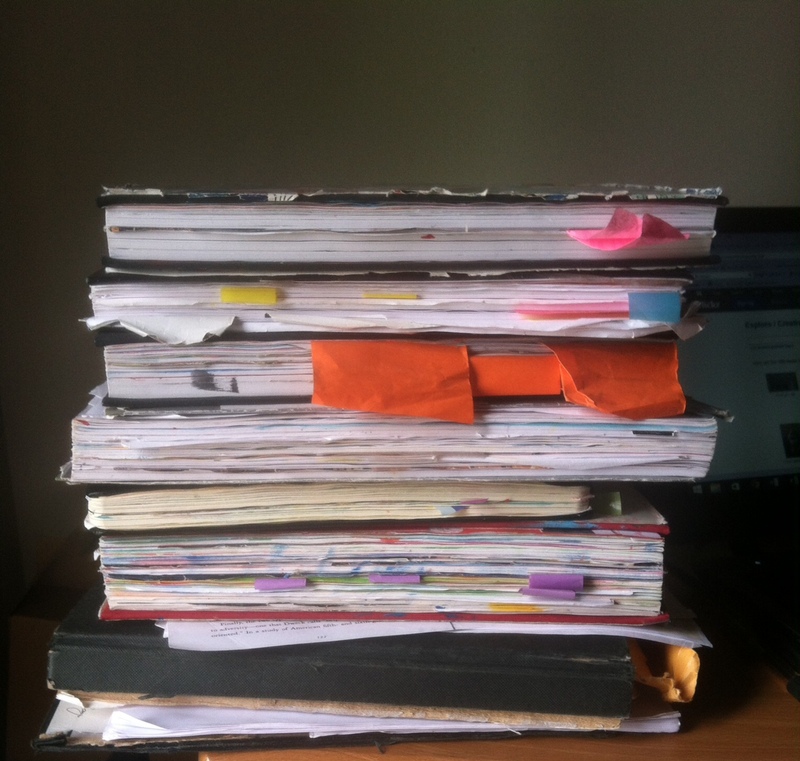 I have kept journals at various points in my life, but I’ve always destroyed them after a few years. I don’t mind having a record of my past self, but I don’t like the notion that other people might FIND it and READ it without my wanting those things to happen. Oh N, reading what your ex did to your journal made me cry–big fat tears. I can’t imagine how painful that must have been. And still is. I’m so happy you’re going to start again though! So happy. Reclaim it with all your heart! And yes, yes, yes! Celebrate your birthday! I’m going to. Yep, I shall be having a drink, toasting to your birth–because the world at large, and my personal world, are both so much better for having you in it! I just wish I’d known earlier that it was your birthday, but I’ll be putting in my calendar so I know next year. So glad you still have some of your journals left and that you’re determined to get back to it – something like that can be so necessary! Happy birthday to you (tomorrow!) and the journal sounds like a wonderful tradition to begin again starting in your new birth year. I bet once you get into the habit you’ll find it such a comfort again. And I’m so glad that Gigi is settling in nicely with the family! oh wow already a month old. Kids they grow so quickly. Happy belated birthday! Hope your day was fun and relaxing. Journals- what a terrible thing for your ex to do. Man, I can feel your pain with that event and your lack of journaling since then. Hopefully the fake it to you make it attitude will help get your groove back because your idea and stack of journals are probably WONDERFUL histories of your life. I was just thinking about you, Bree! How are you? I think I’m going to research poverty in America for our expert experiment. Have you figured out what your topic will be? Hey new mommy lady! Poverty in America sounds like a good topic. Plenty to read. Ive always been drawn to WWII so much, I think that is going to be my topic with focus on Poland and Jews. I’ve listened to several books this summer already and I going to visit Poland in January. Seems like a good choice, right? I think that’s a fantastic topic! I miss writing in my journal, too and it's something I've been meaning to incorporate back into my life. I miss writing in general! Now there's so little of it (since my blog has been so quiet since February). I can't wait to hear more about your journaling! I hope you had a wonderful birthday and are enjoying every moment with your beautiful little Gigi! I’m still figuring out how to get back in touch with the creative/productive side of myself. I hope that your art journals bring you joy!